how can i create a polygon that would encompass all this shapes? is there anyway i can somehow create a polygon based on the manArr variable, that would encompass all the cylinders, without cutting through them? so far the only way i think of is doing somehow a recursive function, but opensCad's restrictions on functions to be one line is driving me insane..
Re: how can i create a polygon that would encompass all this shapes? Is the hull() function any use to you? it certainly does , now if i could just offset, but i'm guessing i'm gonna have to re-do the function that creates the cells, to use circles and not cylinders so the hull would be 2d.. The Help menu links to a "Cheat Sheet", which is a great help for finding out what is available. You could also use projection() to project the hull into a 2D-polygon. isn't the projection involves creating external files first? No, it will project whatever object follows, so e.g. "projection()cylinder(r=10,h=5);" will create a circle. what i'm REALLY looking for is CONCAVE hull, i want the hull to be minimal , and not a Convex one, i've been trying to see if anyone wrote a library for it... but i'm not sure..
As far as I understand there is no such thing as a "concave hull", as this would degenerate essentially to the union with a tiny connection tree between the loose parts. But maybe what you could use is the union of the convex hulls of smaller subsets, e.g. 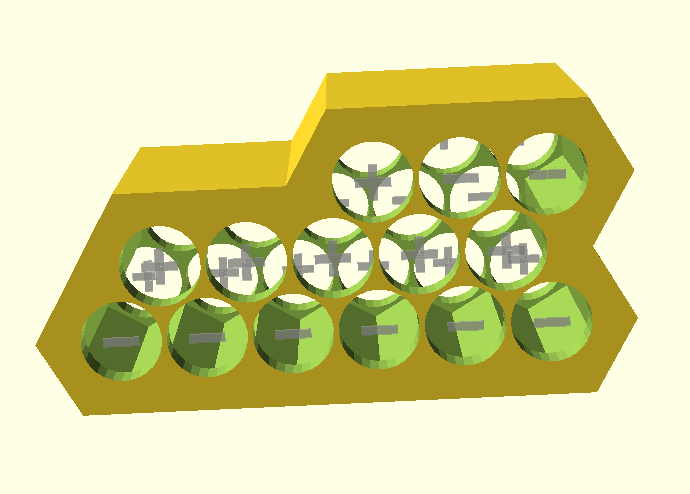 of the straight rows of cylinders, in order to get a closer "shell" around the cells. you mean hull each shape on it's own instead of the whole thing? do you know that if you use variables starting with $ (e.g. $col, $row)they can be accessed by the children(). This would allow you to make a much leaner iterator and access e.g. the cell position and contents of the corresponding manArr entry inside the child code. With drawHoles() being a simple iterator you could easily split the problem into components like outer shell, inner cavity, cell cylinders, etc. BTW, the idea with the alpha-shape as a kind of parametric "concave hull" is indeed interesting - thanks for mentioning it! actually someone just mentioned this to me, i was looking or something like this, after i saw [github.com] library which initially looked like doing a lof of this things i'm doing .. i knew it would make things simpler this way..
my original plan was to upload all of this to thingiverse, but i don't think it has a ui. for setting the arrays. but i lack the algorithm chops do it ...so i took the structured way..